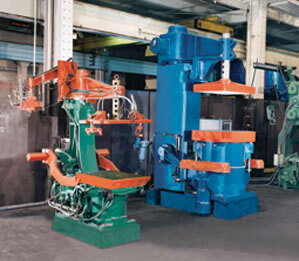 A large number of foundries continue to operate successfully with a variety of squeezers and manual molding machines. EMI acquired the Osborn, SPO, and Herman lines with the intent of continuing to service, remanufacture to near new condition, and provide new standard molding machines. 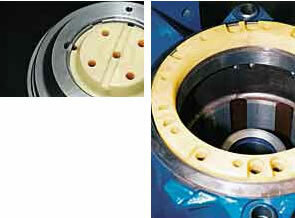 These Osborn Ram-Jolt® squeeze molding machines are easy to operate and require low maintenance. When considering value, more foundries consider our Ram-Jolt squeeze machines as the standard for their profitable jobbing and production requirements. The Ram-Jolt® with Whisperam®, provides reliable anvil pre-jolt, followed by a simultaneous jolt and squeeze process. This combination will produce a harder, more consistent mold. Initial jolting results in uniform mold quality as it evenly distributes the sand in the flask, providing the best condition for squeezing. Since the squeeze force is the main determining factor in mold hardness, the main advantage for using our machine is the simultaneous Ram-Jolt® during this action. This provides the ability to increase the squeeze force generated by the squeeze piston on the mold area by as much as 50%. With the variety of green sand molding machines that have been developed over the years, EMI’s family of Ram-Jolt® squeeze molding machines are still providing dependable service to foundries all over the world.